Writer, musician, photographer, and human rights professional. Through music, writing, photography, Ali MC provides a voice for the disenfranchised and lays down the challenge for change. He invites you to explore the words, music and images that create an unprecedented body of genuinely unique and passionate work. Brought up between Australia and New Zealand, Ali MC saw firsthand the disparity between the haves and the have-nots, in particular, the oppression of Indigenous communities. These early experiences set the tone for a creative and professional life that seeks to explore and understand the stories rarely seen on the television screens. Through all of my projects, I aim to inform, inspire and spark the catalyst for social change. On country, Irrunytju, Western Australia. Ali MC is currently working on his second full-length book, Tail Eat Snake, a rock-n-reggae journey through the deserts of Australia which confronts a personal legacy of colonisation. 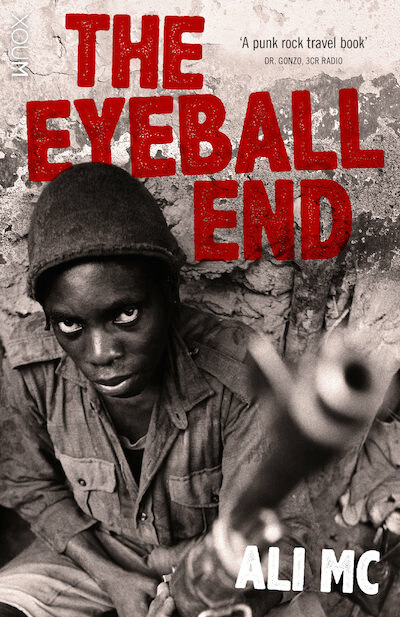 In 2015, his debut ‘punk rock travel book’, The Eyeball End, was released by Brio Books, and steps away from the safety net of well-worn travel guides, taking the reader on a challenging journey into the human condition. A prolific writer, Ali MC’s work has appeared in publications such as Al Jazeera, the Guardian, National Indigenous Television and Right Now Human Rights magazine, where his stories explore the fringes of society, documenting the survival, resilience, hopes and dreams of marginalised peoples. Rohingya Refugees. A Timor-Leste rubbish dump. Indigenous peoples of India. Classic cars of Cuba. All shot on analogue film. Drawing inspiration from the people and places he travels, Ali MC’s photography explores the social conditions that create the human experience - the ravaging beauty, the humour and pride, and the too-often saddening reality. Ali MC’s continued use of film ensures he captures not only a certain aesthetic, but the unique qualities of the people he encounters. West African drumming, Indigenous didgeridoo, Haitian voodoo beats, Indian tabla, soaring guitars and always thought-provoking lyrics, welcome to the musical world of Ali MC. Whether as a solo act, with his world-music collective New Dub City, or as a producer with indigenous reggae bands, Ali MC’s music reflects the world around him, not only in sound but in style as well. Having released numerous albums and a short documentary, played hundreds of live shows, and toured indigenous communities, through his music, Ali MC creates original music with a positive political message and delivers it direct to the people. Believing that social change cannot stem from solely from the arts, Ali MC continues to work professionally in the field of human rights. With degrees in History and Education, and a Masters in Human Rights Law, Ali MC’s career has seen him work with the Stolen Generations, in remote Aboriginal communities, for multi-cultural museums and as a political spokesperson. Ali MC remains passionately pro-active in ensuring social action through education programs, and has contributed to parliamentary and legislative change through his work as a legal professional, in particular in the field of indigenous rights. Follow Ali MC on Instagram / @alimcphotos.